Yesterday and today I’ve been teaching several sessions on videoconferencing & Skype to our annual Berrien RESA Tech Camp. I’ve been super excited because I got to teach with our new upgraded room! It’s actually not as upgraded as some of you can afford, but I’m still excited! So first, here’s what it looked like before. This 60 inch monitor was part of a Goals 2000 Grant installation in 1999. Look at how the colors were bleeding apart in the top right. Very annoying! Of course, now, this is Michigan, and we’re out of money! So the upgrade was actually driven by the Smart award presentation given to MACUL Educator of the Year winners. The award included a Smart Board, projector, clickers, slate, document camera, as well as all the software. I’ve been so excited because I wanted to figure out how to get desktop videoconferencing working on an interactive whiteboard. Last Friday, just in time for tech camp, the last piece was finished in the DL room – mounting the Smart Board, building a cabinet for the Polycom VSX 7000. Here’s what it looks like in a “standards based” videoconference with the Polycom just dialed out to my office unit. Here’s what it looks like in a Skype call with Roxanne Glaser for my workshop today. 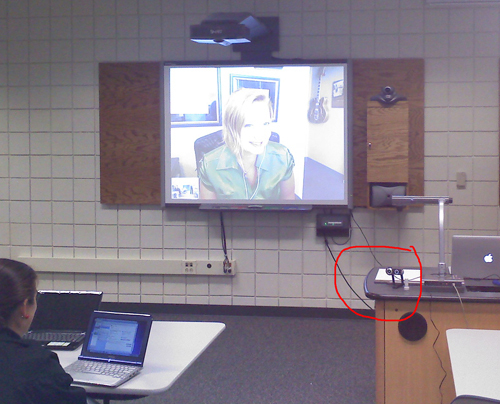 I circled the Logitech webcam so you could see where that is. Next I want to figure out how to use a long USB extension cable to mount the webcam somewhere close to the monitor for whole class connections. Although, the more I play with Skype / desktop VC, I think it’s nicer to be able to pick the webcam up and move it around as needed (sort of like manual presets! ha!). So that’s my new distance learning room. The monitor hanging in the ceiling came out. The pole in the middle of the room came out. It’s a lot cleaner-looking and much more flexible now. Yay! 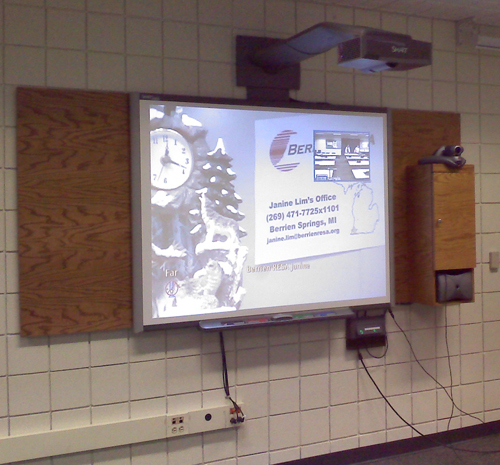 And, now we can do Smart Board training in this room too! I know, I know. A “real” upgrade would mean upgrading to HD videoconferencing. Well that’s on the list, but for now I’m happy with this! Would you be amenable to testing our desktop HD videoconferencing service with your room system? We try to test our service with distance learning room systems, whether they are based on Polycom, Tandberg, Lifesize or Vidyo.